The Salvation Army is aware that Australia is becoming the most multi-cultural country in the world, and doing something about recruiting from the latest immigrant wave. The town of Auburn is a poor area with many immigrants. 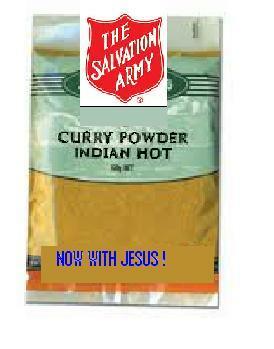 Some of them are from India, so the Salvation Army is currying favour with them through the flavour of curry. According to their web-site (http://salvos.org.au/auburn/ministries/curry-and-jesus/) each Tuesday night they hold a meeting after which a free meal “usually curry” is served, to attract Indian origin Australians to Jesus and the Salvation Army. It is called the “Curry and Jesus” night. As Jesus once said, Man does not live by bread alone – sometimes he needs curry, apparently, according to the local Auburn branch of the Salvation Army. Forget the loaves and fishes thing. That’s so yesterday! No, the Salvation Army does not stereotype people. As the site notes: “Since we were seeing increasing numbers of Indians in the local community and we had felt God’s call to begin an outreach into this part of the community, the Curry and Jesus idea was formed.” Well, of course, as any good racist knows, Indians can’t resist the smell of curry and will have them come running. It has been so successful, 24 young “Hindi men” (as the site describes them) have joined up to the “Curry and Jesus” nights. Indeed, the Auburn branch of the Salvation Army proudly announces that: “More recently some married couples have begun to join this group and in the next 2 weeks we are expecting our first ‘Curry and Jesus’ baby to be born.” Apparently, it can help with conception too! There is a saying that whatever God one prays to, it is Vishnu who answers the prayer. Clearly, the Salvation Army knows this is not so – God is stronger than Vishnu, apparently. With very high unemployment, prayers to Vishnu to get a job were obviously not being answered, but prayers to the Salvation Army’s God were working. Naturally, when unemployed, some people can’t just catch a bus to get the “Curry and Jesus” night, to have a prayer said for them so they can get a job. So the Salvation Army there has thought of a solution to this – the local “Hindi men” can send in their prayer requests on-line (at http://salvos.org.au/auburn/ministries/prayer-requests/). Then, when they get their jobs, they can attend the “Curry and Jesus” nights. Auburn has many migrants of different faiths who have yet to hear the message of the Salvation Army, and gain the benefits of its prayers for them to their God. One of the largest is the Muslim community. There are also a lot of people from Africa and East Asia. Plans would be underway for a culturally-specific “something and Jesus” night for them too, since the “Curry and Jesus” nights have been so successful. The only mistake they have made in the Auburn group is that they must not be aware that there are many types of curry, some of them even being, for example, Thai curry. Their site only employs the generic term “curry” so some people they are currently targeting, might not realize it is Indian curry one can sit down to eat with Jesus. This entry was posted in Uncategorized and tagged Australian Royal Commission into Institutional Responses to Child Sexual Abuse, Curry and Jesus, Lewin Blazevich, Lewis Blayse, Royal Commission into Institutional Responses to Child Sexual Abuse, Salvation Army, Salvos. Bookmark the permalink.